So cute! My 7-year old grandson loves bowties and I made him 2. If I had seen the tie bibs when he was a baby, I would have made him one. I've seen some that are tuxedo fronts. Of course, they have black bow ties... not as sporty as these two. Can't wait to see your munchkin in one. Oh I know you could make those! How cute though! They are so darned cute. 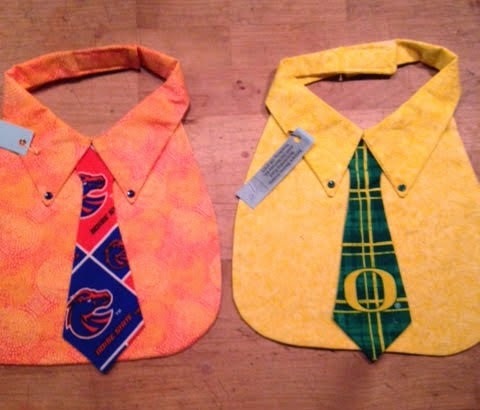 I'm not a sports fan but I can see that these would be super cute made with quilting fabrics! Oh Val, you could make these with one eye closed! They are really cute. Adorable! I'll be watching the Ducks as they meet up with our Twins' university. Should be interesting!